Whether you’re helping students process new information or assessing their understanding of it, a toolkit with organizers to make that happen is priceless. Having a collection of go-to teaching tools can make the learning process better for students and teachers alike. Whether they’re assessment tools to report progress and understanding or instructional tools to help students process information, the bigger the toolkit the better. We’ve already shared Four of Our Favorite Anytime Assessment Tools, and now we have five additional tools that can be used in a variety of situations. What it is: A visual organizer that allows students to gain a deeper understanding of key words and concepts. 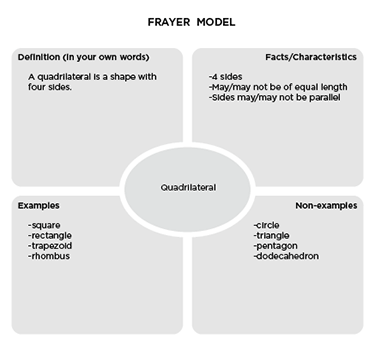 How it works: Students are given a template or create their own four quadrant box with a circle in the center. The key word or concept is written in the circle at the center of the box. Each quadrant houses a different way to manipulate the term. Students are asked to 1) define in their own words, 2) list facts/characteristics 3) list examples 4) list non-examples. 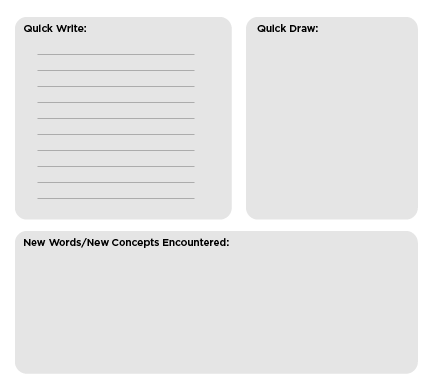 When to use it: This organizer is best suited for when students will be encountering key words that are closely related and/or connected. Students use connections and critical thinking to draw on the relationships among concepts. When the lines can get blurry, this tool helps students understand what something is and is not to avoid generalizations. What it is: This pre-reading tool lists the first lines of sections, chapters, stanzas, etc. from an assigned passage and allows students to infer the big ideas to come. How it works: Students preview a collection of first lines to get a glimpse at the content or storyline to be uncovered in the reading. Once they’ve processed this preview of the content, they create a short written response that describes what they believe is occurring. This gets them thinking about the big ideas to come and making predictions about the content. When to use it: This can be used as an introduction to any new reading selections. 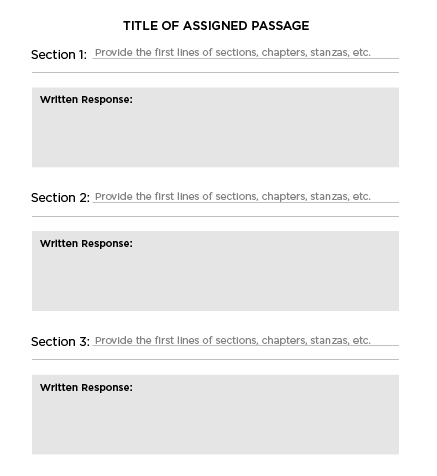 It will help students focus their attention as they read the full passage and make connections throughout the text as they have already had glimpses of that next step. Spoiler alert- not to be used in a whodunit reading passage! What it is: This is a stress-free idea zone. It’s all about asking students what they know, not how well they can write it. How it works: Students can complete this activity as a response to literature or for any type of impromptu purpose. There is a portion of the response organizer for writing their ideas and an area for drawing any images that help them process the information. They are also asked to record any new words or concepts they encountered in the text or lesson. When to use it: This can be used to help students process and retain any new information encountered via text, viewing, or experiences. It can also be used to determine what students already know about a topic to be covered. What it is: This is a great note-taking structure for students to utilize during lectures, discussions, or activities. How it works:Students collect and process information and ideas in a three-step process. As students encounter information, they record facts and ideas from the lesson in a variety of bullet points, phrases, pictures, etc. on the right-hand side of the paper. After content is shared, students process this collection and reduce the information to streamline the essential facts, main ideas, key words, and/or questions on the left-hand side of the paper. A review of this condensed list is followed by recording a short summary of the big ideas at the bottom of the page. When to use it: This organizer will help students whenever there is a need for note taking and can be beneficial far beyond their years in a k-12 setting. This will help students extrapolate the big picture when they are presented with a large amount of information and is a great tool to use when viewing videos for a flipped lesson. What it is: This is a forum for students to express their opinions on selected ideas/concepts and support their views with factual/textual evidence. How it works:Students are given a statement (S) about a topic of study or piece of literature (e.g., Nature plays the biggest role in animals becoming endangered species./Jerry Spinelli’s Stargirl wasn’t accepted because the other students couldn’t define her./ The Declaration of Independence is the most important document in American history.). They put this in their own words and are asked their opinion (O) on it. They must support (S) their opinion with facts, examples, and/or quotes from the text or other sources. When to use it: This anytime activity can be used when any controversial topic is encountered. When completed at the beginning or during the study of a topic, it can be interesting to revisit the opinions at the end to see if any changes have occurred. If your teaching toolkit could use a little reboot, these five favorite organizers are sure to do the trick. Whether you’re helping students process new information or determining their understanding of key concepts, there’s sure to be an organizer that can get the job done. Let our organizers be the perfect addition to your invaluable teaching toolkit!